Cecilia Schiller was featured on TPT’s program MN Original in early January 2013, a show that showcases Minnesota artists and their work. 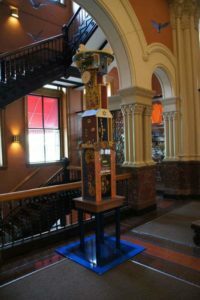 The program was recorded in May in her studio and at the Landmark Center while Cecilia was finishing up work on her interactive sculpture Birdhouse. Click for Cecilia’s story and the full episode. Visitors to the site will find additional content, web exclusive videos and links to MN Original artists.